Such a lovely cover…and the story inside is just as beautiful! Her Motherhood Wish is filled with sweet moments as carpenter Chip Evans and loving Callie Hunt discover their happily-ever-after as they work at the Double T Orphanage. Callie’s dearest dream is to be a mother, but she faces some problems. I sympathized with her as she confronted the reality and disappointment of her situation. She is strong and accepting of her fate. As for Chip, many times I was quite displeased with him. He is protective and hardworking, but blindly adheres to the rigid plan he detailed for his future. However…. he completely redeemed himself in my eyes with the execution of his beautiful plan at the conclusion of the story. A precious ending! I adored the two orphans, Jasper and Ruby, who warmed my heart with their needs and vulnerability. The occasional appearances of other characters from earlier books were a delight, but this book can definitely be read as a stand-alone. The suspense element in this story is an intriguing bonus. Author Keli Gwyn always includes interesting historical detail in her stories, such as the art of cabinetry in this book. Her books touch my heart with their gentle message of faith and leave me with a happy sigh at the end. Great storytelling! I hope you enjoy Her Motherhood Wish, with its beautiful conclusion, as much as I did. *I was given a copy of this book. I’m pleased to offer my honest review. 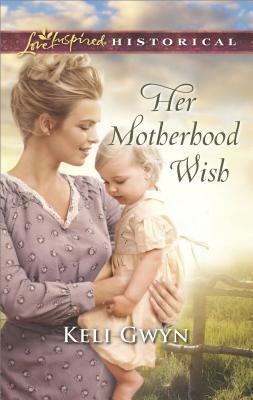 Sign into Goodreads to see if any of your friends have read Her Motherhood Wish.